St. Louis hosts one of the grandest Jul 4th celebrations. 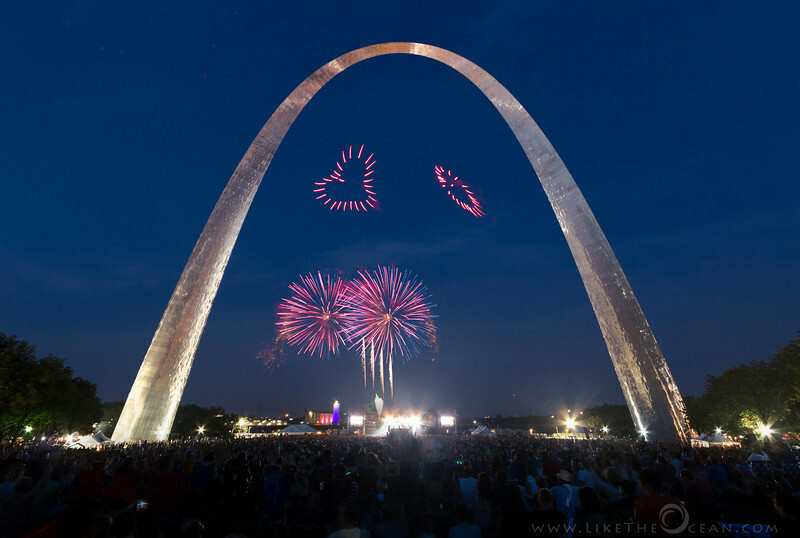 With the fair, food carts, live band, fireworks all under the majestic arch – it cannot get any better. To top it off, the show continues for 3 days around Jul 4th. Shooting fireworks is fun. But including a sense of surrounding and the mood really makes it even more interesting. This shot of the Seattle space needle with fireworks is one of my favorites. So when I learnt about the Arch and fireworks, started digging around with Google earth and TPE for potential spots. After some planning decided on the location – some accessible spot from the other side of the the river, across the railway tracks and as close to the water as possible. The next day we decided to head right under the arch. Built at 630 feet and with 900 tons of stainless steel – Gateway Arch - is the tallest national monument within the United States. Standing beneath it gives a sense of awe and humility. None of the pictures does justice to its grandeur. One really need to be there to experience its size. P.S: Check this out for more cool information and history of the Gateway Arch.